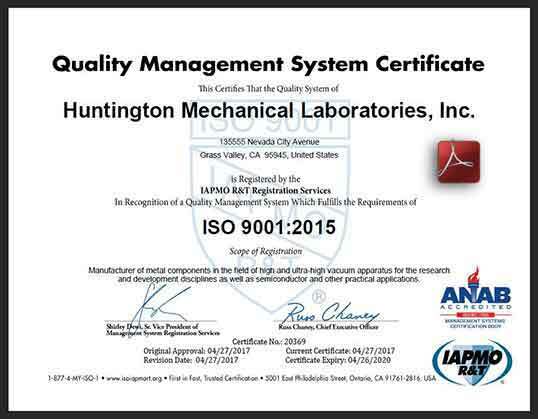 Huntington Mechanical Labs is proud to announce the certification of our quality and management systems by the ANSI-ASQ National Accreditation Board (ANAB) to meet ISO 9001:2015 standards. 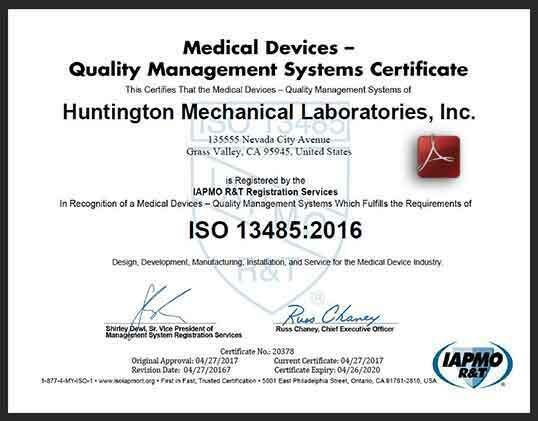 At the same we met this milestone we also applied for and achieved accreditation in ISO-13485:2016 to meet the standards for manufacturing Medical Devices and related products. As an OEM Manufacturer we felt this was important to show the world that we adhere to our own strict processes and procedures to deliver world-class products for the high vacuum industry. Our 40+ years of experience in building products for space exploration, lab research and industrial processes has given us a unique insight into the design and manufacture of devices used in the medical field. 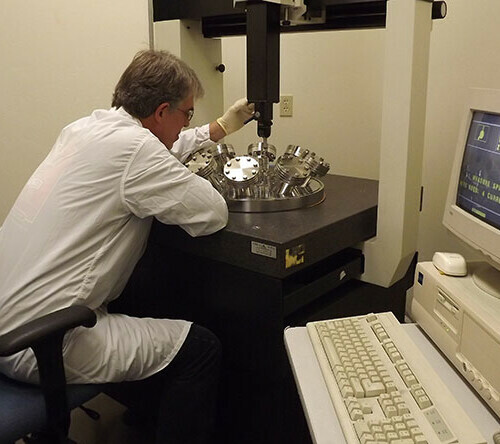 Attention to detail, cleanliness and the highest quality materials that we provide every day for ultra-high vacuum is also used for various medical devices and equipment. This is a natural fit for us and we will deliver quality medical products with the same excellence we apply to all our products. Something new and some things brought back for the New Year! We are pleased to bring back the Push-Pull style of mini linear motion feedthrough series L-2121. Although this model has been produced for over 20 years due to recent popular demand we have brought it back to include in our stock items catalog. This model is quite cost effective and sturdy for those seeking a simpler linear motion in their feedthrough. As always, custom shaft tip details to your specifications are available, plus many other modifications as required. A new, larger version of our X-Y axis Manipulator is now available. Our standard versions of the TS-series now include the larger 4-1/2″ CF flange mounting along with the 2-3/4″ CF flange models. Both models are available with or without bellows & flanges depending on your needs. These models are also available in motorized versions allowing for greater flexibility in operation. Talk to one of our technical support specialists to spec out your choice of encoder, single or multi-axis encoder and cable set for a turn-key solution. We are also pleased to offer our large drum Micrometers for individual sale for use in your own projects. Designed & manufactured by us in our state-of-the-art facility they are offered with a generic shaft length and end features that can also be modified by our machining services to meet your exact needs. Here’s to 2017, may it be the best yet! We know that money is tight everywhere but oftentimes so much more so for the engineering or science student trying to finish up lab work or the university lab struggling to make sure all students get an opportunity to excel. 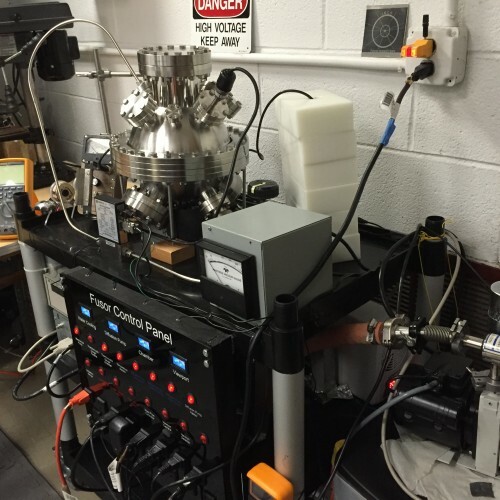 That’s why Huntington Mechanical Labs is making available to qualified individuals or entities a selection of products for use in high and ultra-high vacuum experiments and projects. Please email us at Technical Sales and indicate your organization and what type of product you seek. If we have what you need we will make every effort to help you succeed! 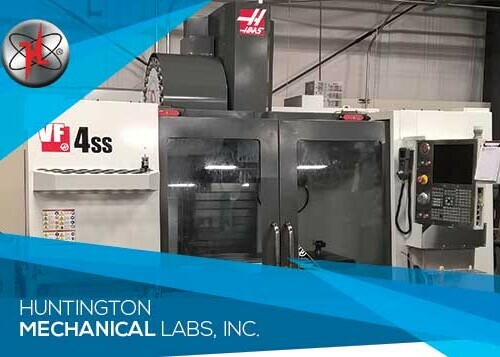 At Huntington Mechanical Labs we strive for constant improvement and increased capabilities. We are proud to announce the addition of high speed machining capability with a Haas VF-4SS milling center. This machine features 12,000 rpm spindle speeds and ultra-fast tool changes without sacrificing high tolerances and best-in-class finishing. Increased demand for our products has prompted Huntington to increase our workforce as well as adding production capacity. As we look ahead to the second half of this decade we’re seeing increased demand for several product lines requiring a commitment to growth which we are poised to implement. Our commitment means you can rely on Huntington to deliver on-time and in-spec. We’re working hard at presenting a new website loaded with all the latest technology to enable a more graphic representation of our products and an easier ordering experience. This new site is mobile device friendly that features an auto-resizing function for small screen devices to make your experience easier while still accommodating large screen devices like workstations and full-size laptops.